Homestead Orchards is owned and operated by the Pegg family, and has been for several generations and has now evolved into a focus on apples and strawberries. 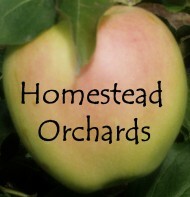 Over 20 varieties of apples are grown in We Pick and Pick Your Own orchards. They are sorted, packed, processed and marketed right on the farm. It is important to us that we have a close connection with both our products and our customers. Our stewardship of the land has a high priority as we take pride in using environmentally friendly practices such as composting, encouraging the use of reusable resources, water conservation and integrated pest management which results in minimal spraying. For more information please call 905 722 5325 or visit the website.